As any readers with a MacBook know, there’s always a constant struggle when it comes to getting all your devices sufficiently connected. Since there are only a limited number of USB C ports (particularly if you’ve got a non-Pro MacBook), most folks are resigned to either hot swap them out as needed or pick up a USC C hub, which can be pretty pricey- Particularly for a decent one. 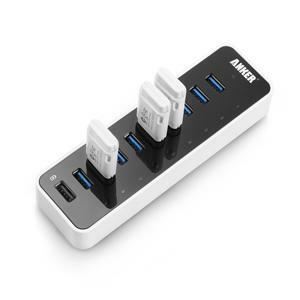 If you’re in the market for one of those hubs, Amazon’s Gold Deal for Today has a pretty hot price on a three port charging/data hub from Anker. 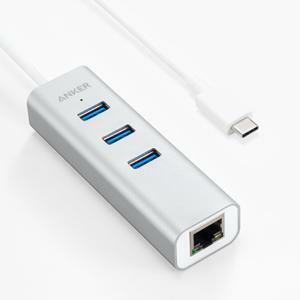 Not only do you get three USB 3.0 slots from one USB-C, the hub also throws in an Ethernet connection in case you want to do a hard wire connection for your laptop. Unfortunately, this particular hub doesn’t do USB-C power pass-through for your MacBook (so you can’t use the same USB-C port to charge while using this hub) but it’s still a great find if you have multiple iPhones/iPads and other random devices that you need plugged in. The USB plight applies to more than just laptops of course, I’ve installed USB cards and a motherboard that has as many USB slots that I could find and I still find myself on the verge of needing more. That’s why I’m pretty happy with this next Gold Box item, which is a 10-Port Anker data hub that also has 60W of total charging. So, not only do I get an awesome hub that charges fairly fast, but each one of those USB slots are active connections so I can connect things like my mouse, keyboard and myriad of other devices that my desktop handles. For anyone interested in the above two items, this deal ends today so purchase while you can. Eli Note: Eric is being pretty polite here regarding Apple’s constant removal of ports from computers, but the deletion of the ethernet jack (among others) is seriously stupid. I travel a ton and still find myself in situations where the WiFi is ruined (particularly at conferences) but there’s ethernet jacks available. These multi-function USB-C combo hub and ethernet adapter devices have saved my bacon more times than I can count to get videos online when convention WiFi was slower than tethering to my iPhone. Posts like these feature Amazon affiliate links, and we get (very small) kickbacks from Amazon when you buy things by clicking through them. This goes a long way to supporting the site, and comes at no extra cost to you. All of the products featured in these types of posts are things we use ourselves, and would recommend to both friends and family. If you’re not into this particular item(s), we’d really really appreciate it if you’d do your Amazon shopping by first visiting toucharcade.com/amazon !